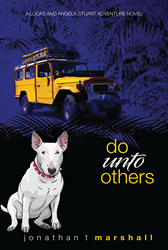 Recent release “Do Unto Others” from Page Publishing author Jonathan T. Marshall is a telling story that depicts the trials and tribulations of being a missionary in remote Angola. Jonathan T. Marshall, a husband, surgeon, foreign medical missionary, traveler, Ph.D. in Theology, researcher, Christian, devoted writer and author, has completed his new book, “Do Unto Others”: a gripping and potent work about disease, death, war, love, fate, belief and strength. Published by New York City-based Page Publishing, Jonathan T. Marshall’s poignant tale is a unique love/adventure story with many twists. Even if everything had gone as planned, Dr. Lucas Stuart and his fellow missionaries would have found their task a dangerous and daunting one. They not only had committed to serve as medical missionaries at a remote Angolan medical outpost in 1970, but also found that they were unwittingly signed on for a life-and-death struggle against seemingly insurmountable challenges. They were forced to put their knowledge, skills and Christian Faith against formidable diseases, hostile natives, the scarcity of modern medicine, widespread poverty and the constantly changing elements. To make matters worse, Lucas and his medical team found themselves unwilling participants in a brutal civil war that would test their courage, faith, and fortitude to the limit. This set them off on journeys that would bring them face to face with extraordinary challenges, ranging from unpredictable terrain and aggressive rebels to the newly emerging Ebola virus, thieves, savage crocodiles and human slave traffickers. One thing was for certain, Lucas had not expected to fall deeply in love in the midst of the turmoil with his nurse Angela Abercrombie, setting them off on a different sort of journey with their unlikely companion, an intensely loyal dog name Luba. For Lucas and Angela, the harrowing travels and endeavors through the toughest jungles and savannah regions of Africa was also a journey of the heart. Readers who wish to experience this profound work can purchase “Do Unto Others” at bookstores everywhere, or online at the Apple iTunes store.